[Black Tulip] Script - BENTO Faces BASIC - AVsitter Plugin and [Black Tulip] Script - BENTO Faces BASIC + Animations - AVsitter Plugin in Marketplace. Follow these directions carefully. Complete the Step by Step Guide in the first place and then go to the Advanced Setup section for a detailed explanation of all the features. There's a Troubleshooting section at the end. Before asking for help, check that your problem isn't one of the problems described in there. License of Use: Click here to read the License of use. If any of these is missing, contact Auryn Beorn for a replacement. Our step by step example consists of a fireplace with two poses for couples. This teaches us how to use the script, and how to use it when more than one avatar is involved (which might be the usual). 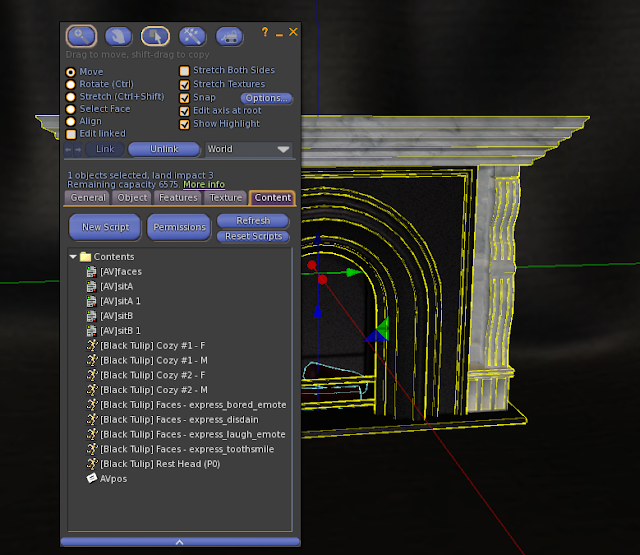 Rez the included [Black Tulip] SAMPLE Fireplace w.AVsitter 2 sample object. It's prepared with AVsitter 2 and, important, including the [AV]faces script. You need [AV]faces if you want to trigger the facial expressions in default avatars and have access to the [DUMP] function that outputs all the ANIM lines. Drop the included animation [Black Tulip] Rest Head (P0). This is perhaps the most important step. Now we have to answer to this question: How many avatars is our engine for? In our example case, the engine is for TWO avatars. This means that we have to drop TWO copies of the [Black Tulip] Faces BASIC v1.0 - AVsitter Plugin script inside the engine. (Change permissions for next owner in inventory before dropping the script or it will self delete). This script reads directly from the AVpos notecard. It notifies when it's done. 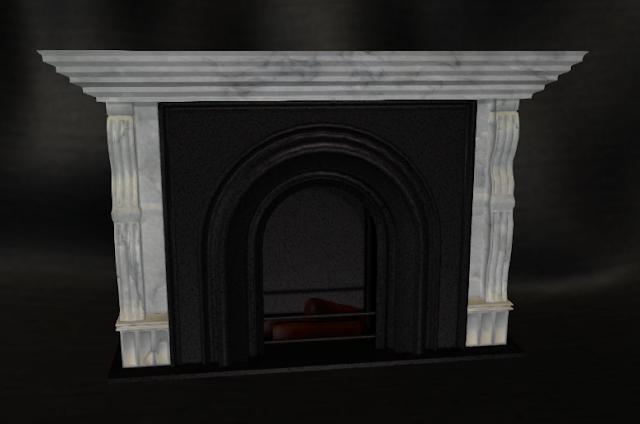 You can find the finished sample as the [Black Tulip] SAMPLE Fireplace w.AVsitter 2 - COMPLETE object. NOTE: Not all animations of all creators are made the same. In some cases, you may find that after stopping the animation, you're still stuck in the pose. You can use the supplied [Black Tulip] Reset Facial Expressions (P6) animation by playing it directly from inventory, and if that doesn't work, then you need to undeform your avatar in the Avatar Health menu (at least in Firestorm). This [Black Tulip] Reset Facial Expressions (P6) animation is NOT used by the script, and you can give it away freely if you wish. Keep in mind that [FACES] is already used by [AV]faces. Q: I've added my animations, but they're not working. A: Make sure that you've renamed them as explained. If you don't wish to rename the animations then you need the PRO version of this script. Q: I've added the ADJUST line in AVpos, but the button isn't showing under [ADJUST]. Q: I've added the ADJUST line in AVpos and checked the previous question. The button isn't showing under [ADJUST]. It is likely that you're using one of the first versions of AVsitter 2. Update to the latest version to have all of AVsitter's feature - including this one. If after having followed the directions and checked the troubleshooting list, you have problems making the script work, please click here for the customer service form.